This week was special here at United Studios of Israel – we celebrated the premiere of three new shows. Anyone who works in television knows that getting a show on air is a long and arduous process that involves many people and takes several years, for drama series, and many months for non-scripted. So while each of our new shows had its own gestation process before it saw the light of day, somehow, all three ended up debuting at the same time. This made for an exciting, celebratory, and gratifying week for team USI. Kicking off the trifecta was The Exchange Principle. 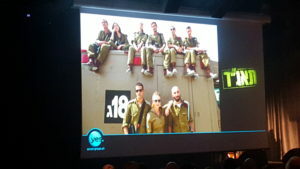 The premiere of Noah Stollman and Oded Davidoff’s unique police drama was held at the Tel Aviv Museum. The start-studded cast, crew, and guests celebrated HOT’s high-end drama about a former police crime scene investigator living as a homeless man that returns to investigate his last case. The reaction was amazing, and we can’t wait for it’s international launch at MIPCOM. The next day, The People Have Spoken – our new social-experiment hidden-camera show – launched on Channel 10. Our elite hidden-camera commando unit – the same people behind international hits Deal with It!, and Who’s Asking? – took to the streets to find out where Israelis stand on various topical polarizing issues. Two acerbic hosts and special guests watch the experiments and comment on the results. Among the things examined were, if a boy wears a pink shirt does it make him gay? Will Israelis buy a decoy “third arm” so they won’t get stopped by police for texting while driving? Will people subscribe to a service that calls their mothers and listens to their complaints so they don’t have to? The results might surprise you, and our sharp-tongued hosts spare no punches when they dissect the segments. And speaking of elite commando units, on Wednesday we partied at the premiere of our new series The Medical Field Unit. This multi-episode drama, airing on YES, tells the story of hormone-addled young soldiers at an army medical field unit that investigate the disappearance of their beloved unit doctor, and find themselves mired in military conspiracies. We salute our production team for maticiously recreating an IDF base, and the wonderful and beautiful cast for their five star military-grade performances. We hope you like these shows as much as we loved making them, and stay tuned for more great things coming to you from United Studios of Israel.